Hi, My name is Sarah, I am 24years old from Australia, and would like to privilege of sharing my wonderful experience with Koseli School. My first day at Koseli started with entering each classroom in which the children would almost chant “good morning ma’am, you are welcome to our class,” this instantly putting a smile across my face I would eagerly sit in each class for around fifteen minutes to get a feel for the school’s morning routine. I first noticed the importance of the children’s hygiene and presentation, one by one the children would show their teacher, firstly showing that they had done their hair neatly, then their teeth, then their nails, lastly showing their clean handkerchief, if the children did not meet the teacher’s requirements they then have to go wash, brush ect, again. At the beginning I thought this was an unusual routine, and perhaps a little time consuming. As my day went on and I learnt about some of the backgrounds of these children and there lack of resources to hygiene, I began to realise that the hygiene process was just as important as the learning process. The children would come on a morning, their clothes dirty, hair messy, they would shower, brush their teeth and hair, and change into the koseli uniform, this was such an important ritual for the children these basic steps that a western child would think nothing of, would help prevent these children from diseases and teeth problems. After lunch, I meet with the two students that I would be teaching, Bhuwan and Suraj. As my background education is not teaching it is in Sociology and Peace and Development studies, it was agreed upon that two students would be the most beneficial for both the children and myself. It also allowed me to bond with these children, get to know them, their sense of humour, their limits, their individual personalities. This becomes important when the language barrier is there. Both these children live on the school premises, they were found begging on the street and living in extremely poor conditions. This school truly is a gift to them. It was so much fun everyday thinking of fun English games and activities to get them motivated and excited, I would even attempt to throw in a little science and maths. Of course everyday has its challenges, but the motivation these children have to keep going everyday and learn and to try provide themselves with the opportunity for a future made everyday so unique and worthwhile. I was lucky enough to experience one of the two a year outings, due to lack of funding only two is within the schools limits. We cramped into a bus, yes the whole 120 of us, and out of the city we went to some beautiful botanical gardens. One of the teachers informed me that on these outings they let the children “get in touch with nature”, in other words let them go wild. And we did. We sang songs and played games, it was magical watching them be free, happy and without a care in the world. On the trip the children got supplied a light snack which consisted of a banana, a juice and some butter biscuits, they loved it. We even sat and did a meditation all together. 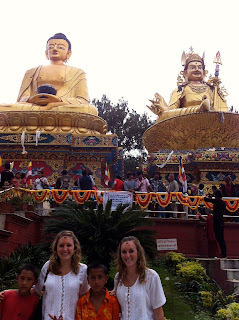 Another more intimate outing I got to experience was with my two students, I was allowed to take them with me to Buddha Janti, (Buddha’s birthday) a celebration held at a monkey temple. They could not get around the festival quick enough to see and experience everything there, we spun over 100 prayer wheels, lit butter lamps for world peace, the boys had a Nepalese tea and biscuit that is offered for free as a way of good Karma. The devotion of the teachers, who themselves all have a story to tell is the backbone of the school. The children truly do come first. Renu, the founder of Koseli comes everyday and helps assist with Mindfulness class. These classes are great to watch, the children read out journals they wrote that morning, they describe a scenario in which they felt happy, and one in which felt sad, this was very entertaining. Then they would meditate. Renu’s enthusiasm was beautiful to watch, her care and motivation for the school and each individual child was written all over her face. It is interesting how you can travel to the other side of the world, to teach these children, and in the end you walk away with probably more wisdom and knowledge than the children did. The experience is one that I will cherish for the rest of my life. I would like to thank the children and teachers for welcoming me into the school and allowing me to have this journey.